A Grammar of Modern Indo-European, Second Edition, is a complete reference guide to a modern, revived Indo-European language. It contains a comprehensive description of Proto-Indo-European grammar and offers an analysis of the complexities of the prehistoric language and its reconstruction. Written in a fresh and accessible style, this book focuses on the real patterns of use in a modern Europe’s Indo-European language. The book is well organized and is filled with full, clear explanations of areas of confusion and difficulty. It also includes an extensive bilingual dictionary, etymological notes, and numbered paragraphs designed to provide readers easy access to the information they require. An essential reference source for the learner and user of Indo-European, this book will be the standard work for years to come. 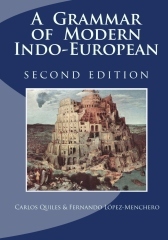 A Grammar of Modern Indo-European, 2nd edition. Bookmarked, Coloured PDF (English) v. 4.15 (15.3 MB). In 2 main parts (grammar and lexicon): A Grammar of Modern Indo-European, 2 ed, Part 1 – Grammar, and A Grammar of Modern Indo-European, 2 ed, Part 1 – Etymology) v. 4.15 (5.8 MB). 16 Oct 2009 :: (v. 4.15) Revision of the English-Indo-European dictionary, and some minor corrections. 01 Oct 2009 :: (v. 4.1) Revision of the Etymological Notes, according to Fernando López-Menchero’s newest version of his Lexikon. 01 Sep 2009 :: (v. 4.0) Full revision of the book. The Modern Indo-European Grammar enters Version 4. Please go to A Grammar of Modern Indo-European, First Edition (outdated).